I’ve learned this ornament from my neighbor when I was little, and, since then I keep doing it almost every year near Christmas. 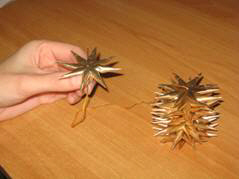 To do these baubles you need a kind of paper that has foil on one part. You can find this kind of paper on the package of the chocolate or Christmas candy. You start by drawing fifteen circles on the paper and then cut them. My circles have five-six centimeters. After that, you divide the circle in eight equal parts, like in the drawing below, using the pencil then the scissors. The center has to remain uncut. 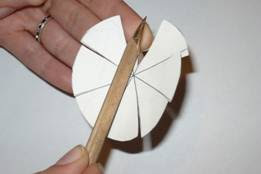 Then you take every of those eight parts and fold each other using the top of the wooden pencil. The procedure is shown in the pictures below. 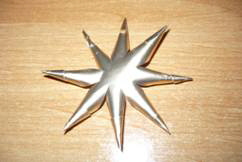 After you fold all the parts, the result will be an eight-pointed star, which is by itself a decoration. After making fourteen or fifteen of these, you put them one by one on a thread that has a button on the end. After stringing all of them, you put a button over all. Then you catch with one finger every button and you press. You pull the thread both ways and then you make a knot right near the button, so the stars remain in the same position. The last step is making a hanger. See top photo. The result is a very beautiful bauble. 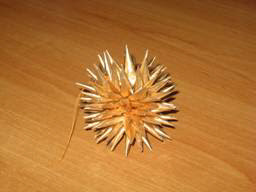 I have called it "the hedgehog bauble!" Copyright © 2009 by Florentina Tudosie. All rights reserved.